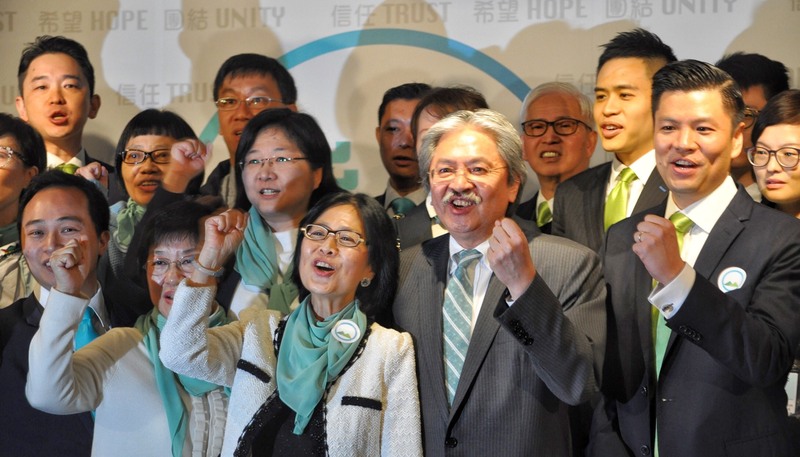 Unity, trust and hope in a better Hong Kong - that's the vision of former financial chief John Tsang Chun-wah as he finally announced his bid for the chief executive's job. And he wants young people to see a future here rather than wanting to move out. Tsang made the announcement in Central, live-streamed through a new Facebook page yesterday, three days after Beijing approved his resignation, which took 35 days. The former No 3 official, who ended months of speculation by declaring his bid for the top post following the announcement on Monday of the administration's former No 2 Carrie Lam Cheng Yuet-ngor, also outlined his platform in front of a banner with his slogan "unity, trust and hope." "I've done a great deal of soul- searching, and I can tell you, I am more determined now than ever to serve this city of ours," Tsang, 65, said. "What we need is to rebuild trust, re-establish unity and rekindle hope." Tsang said Hong Kong has been torn apart in recent years as he slammed a small minority of people who "cannot distinguish right from wrong" by using the name of independence to separate the country and insult the relationships of Hong Kong people. It is "dawn at the end of a long dark night" if the city can find solutions under Lion Rock during his governance. "We can write the history that we want to see." In his 30-minute speech in Cantonese and English, Tsang recalled emigrating to New York at 14 and living a hard life as a Chinese-American, realizing the importance of Chinese to come together. "I do not wish to hear people saying they want to emigrate, having to experience of the bitterness and miserableness of it." Work should be done to ensure not only people will no longer consider emigration and that youngsters can see their future and build their families here. "I may not live long enough to see how, but I can surely help lay the foundation for it," he said. On the policy front, Tsang agreed with the Leung Chun-ying administration's priority in solving the housing problem to tackle high property prices. More flats should be built and more land should be developed through large- scale reclamation and urban renewal. National security law Article 23 and relaunching political reform are matters that must be tackled, but they depend on the social atmosphere over the next five years, he said. Tsang, who admitted he has yet to secure a single nomination from the 1,194-strong Election Committee, said he will draw support from people from across the political spectrum, including the 325 pro-democracy Election Committee members as he hopes for a fair and just election. Asked if Beijing tried to dissuade him from running, he said there are "friends" who support him and some who do not. He also refuted rumors that he was offered a post at the Asian Infrastructure Investment Bank in return for not joining the race. Tsang joined the civil service when he returned to Hong Kong in 1982 after finding the city facing a confidence crisis. He assumed the office of commissioner of customs and excise in 1999, rising to become finance chief in 2007. "My 34 years in the government have allowed me to meet people from all walks of life and observe different leadership styles. I walked together with Hongkongers. I understand Hong Kong," he said. In a move to show his loyalty to China, he added: "Love Country, Love Hong Kong have never been just empty words. "We've proven our love for the country way before 1997 by pitching in and helping out whenever our countrymen faced difficulties." His son Terrence Tsang Tiu-lung and wife Tsang Wong Lynn-wah attended the hour-long press conference along with former civil servants and alumni from his alma mater, La Salle College, with former civil servants Rebecca Lai Ko Wing-yee and Sandra Lee Suk-yee as core members of his campaign team. Carrie Lam said she welcomes Tsang joining the race as his bid has heated up competition. Regina Ip Lau Suk-yee said she "welcomes competition and a fair election," while Woo Kwok-hing criticized Tsang for his "weak stance" on political reform. Liberal Party honorary chairman James Tien Pei-chun, who endorsed Tsang, said he will offer him his nomination.